This red straw cloche hat has a look of a 1930’s cloche. It’s made from natural straw, which has been hand blocked in the old fashioned way, also lined in satin and banded. It is trimmed with a wonderful gold French vintage ribbon, a fan of pleated ribbon, and the little embellishment is from an art nouveau buckle. So chic! The colour is difficult to describe, but I’d say it’s rust or brick red. Please see all the photos to appreciate the details. 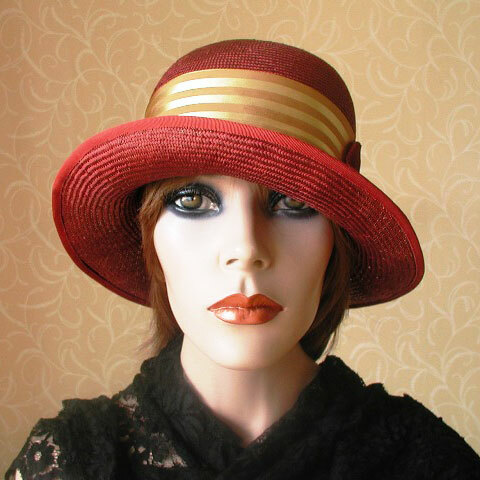 This red straw cloche hat best fits approx size 22″-22½”, a little more or less, but if unsure, please email me. Also if you have any other questions. Handmade in Scotland, with love.